Zucchini is everywhere! I didn't grow any this year, but my friends did, and they are giving it away! I love it when this happens, who doesn't love a free vegetable? I love working with zucchini because it is like working with a blank slate. It's a great diet food, as it is only 33 calories for an entire medium zucchini. Along with 6g of carbs and 2.5g of protein, this is a good vegetable to incorporate at the dinner table. If you family won't eat it straight up, then chop it up fine and add it to muffins, egg scrambles, banana bread, brownies or meatloaf. You can eat zucchini raw or cooked, skinned or unskinned. And did you know it was loaded with Vitamin C and Manganese? This recipe is so easy that it really isn't a recipe at all, but more of just something you assemble. I did include a recipe in case you want to print it for later. A fabulous way to use this delicious, bountiful vegetable! Preheat over to 425. In a medium bowl, toss the rounds with a bit of olive oil and salt and pepper. Line a baking sheet with nonstick aluminum foil. Place rounds in a single layer on the foil. Top each round with pizza sauce, parmesan cheese and a piece of pepperoni. Bake about 5 minutes. Turn oven to broil and broil about 3 minutes, until cheese is melted and pepperoni is cooked. The thicker the rounds, the more of the crunch they will retain. I find that 1/2" is perfect for my family's taste. These can be prepared in advance, up to the baking point. Pop them in the oven when you are ready to serve. 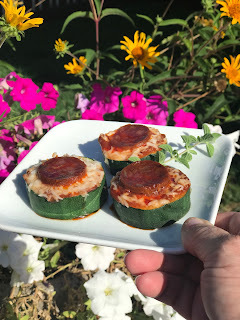 These are delicious on the grill, just watch them and remove when the pepperoni and cheese have done their thing. 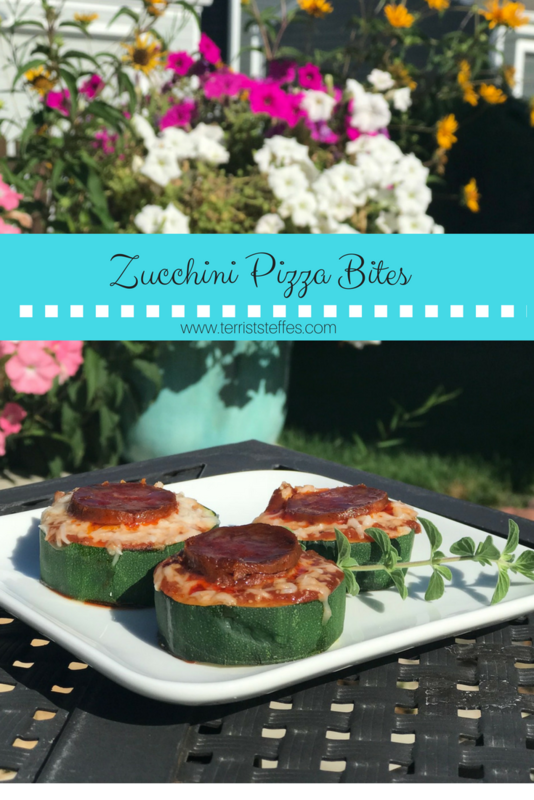 Check out these other delicious zucchini recipes from the Foodie Extravaganza bloggers! If you are a food blogger who would like to join us, please check out our Facebook page here.